A Boaring Story . . . I had my second encounter with a sanglier, or wild boar, last night. My first was just before Christmas when I caught one in the headlights of my car. He, or she, was moving through a stand of trees and by the time I’d braked for a closer look (from the car, of course) had disappeared into the woods. I’ve been fascinated with sanglier since I first arrived in France. I was in the Dordogne and there was a discussion about hunting and eating sanglier. Someone had mentioned seeing one in the woods–the woods where I took my daily walk. They don’t usually bother people, I was assured, unless they are provoked. Still, I stopped walking in the woods; who knows what a sanglier might find provocative? In the fall, by then I’d moved to Montpeyroux, I saw chasseurs, hunters, in orange vests along the sides of the roads, rifles at the ready. I tried to engage one of them in conversation, but my French was limited and he was more interested in spotting a boar . . . or perhaps he found me a bore. Sorry, couldn’t resist. On some days, my walks through the vineyards were punctuated by the sounds of rifle shots–scarier even than a provoked bore. I learned not to walk on Wednesdays or the weekends, the times when hunting is allowed. I really, really wanted to taste sanglier. Hypocritically, I didn’t want to see one shot, I didn’t want to hear the gory details, I just wanted a chunk of roasted boar. 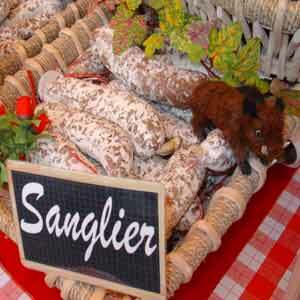 Everyone it seemed had just finished a meal of sanglier, or knew someone with a freezer full, promises were made but the closest I came to an actual taste was the sanglier saucisson at the Saturday market in Gignac. I bought some, but, blindfolded, I wouldn’t have known whether it was sanglier or canard–also sold at the market. I told a friend, whose French husband is a hunter, about my quest. She’d eaten so much sanglier recently, she was bored (ok, pun intended) with it, she’d see what she could do about finding some for me. A week or so later she called, no sanglier but she could give me a duck. Well, ok, I guess. A quick question though. I hesitated. Would it still have feathers? And a head? She laughed. Bien sur. Then she confided a little secret that helped to keep the marriage harmonious. When her husband brought home the limp and feathered ducks, she’d take them to her neighbour next door, then pop off to the supermarket and buy the plastic wrapped variety. Her husband always complimented her on the meal, she said. Nothing like freshly killed duck. But back to the sanglier. Here in the winemaking village of Laurens, I’ve learned that sanglier love ripe grapes and this can take quite a toll on crops. Hunters are needed to keep the population down, reputedly about to take over France although you couldn’t prove it by me, but timing is everything. A few weeks ago, this led to an interesting encounter between the chasseurs and a busload of tasters who had come to visit Brigitte’s cellar at Domaine de Cébène. I wasn’t there, but Brigitte described the scene in an e-mail. As she waited to greet her visitors, she could see dozens of hunters in their orange vests milling around. A bit nervous, she waved a brightly coloured scarf above her head. The bus arrived, the tourists piled off. A delegate from the hunting group also arrived. 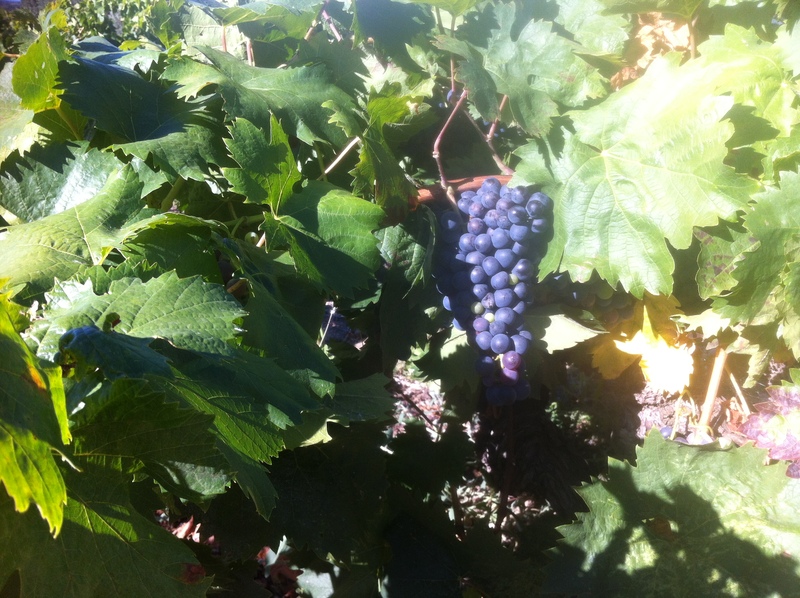 The tourist bus must leave, he told Brigitte, a hunt was going on–in her vineyard! A stand-off ensued. You have been informed, the hunter said, if anyone gets shot, it will not be our responsibility. The wine tasting went on. No-one was shot. Perhaps not even a sanglier, I don’t know. And now about my second encounter with a sanglier. Finally. There it was on my plate last night, marinated and served in bite-sized pieces at my friend Bassie’s birthday party. 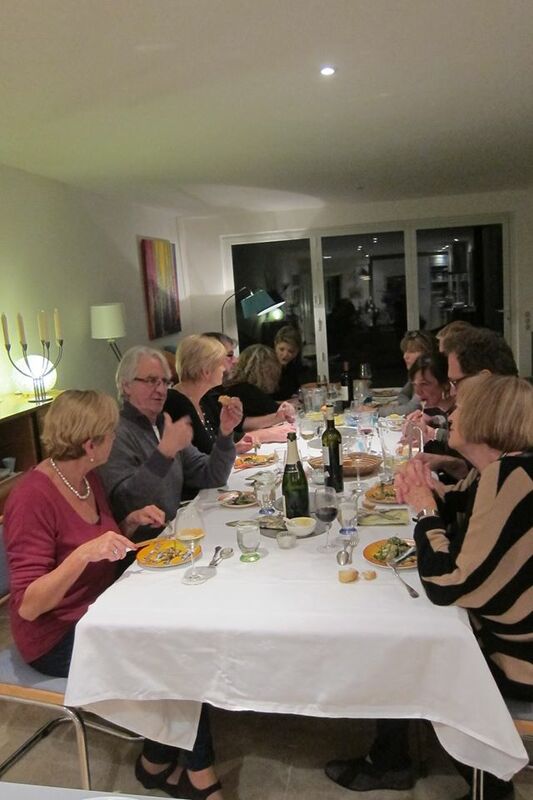 Bassie is in the foreground in a pink sweater, I’m at the other end of the table, the back of my head to the camera, fork at the ready. There was also mashed potatoes and gravy and some vegetables. I only had eyes for the sanglier. It was delicious.